Although vitamin B3 was discovered in 1867, there were no detailed studies carried out until the 30s of the 20th century. In this time, the United States was infected by pellagra epidemic – a skin disease that 3 million people came down with, including 100 thousand that died of it. At the beginning pellagra took the form of flaking off skin areas, discolourations and blisters. The lesions were frequently accompanied with headaches, depression, insomnia and diarrhea. The main cause of the disease was poor diet that lacked vitamin B3, to give one example. And this is how the alternative name of this vitamin came from – Vitamin PP stands for Pellagra Preventive factor. As it is easy to realize, vitamin B3 have been known for over 100 years now, however, the researches on its external impact on skin has being conducted fairly recently. Probably this is the very reason why vitamin B3 wasn’t so popular with cosmetologists. 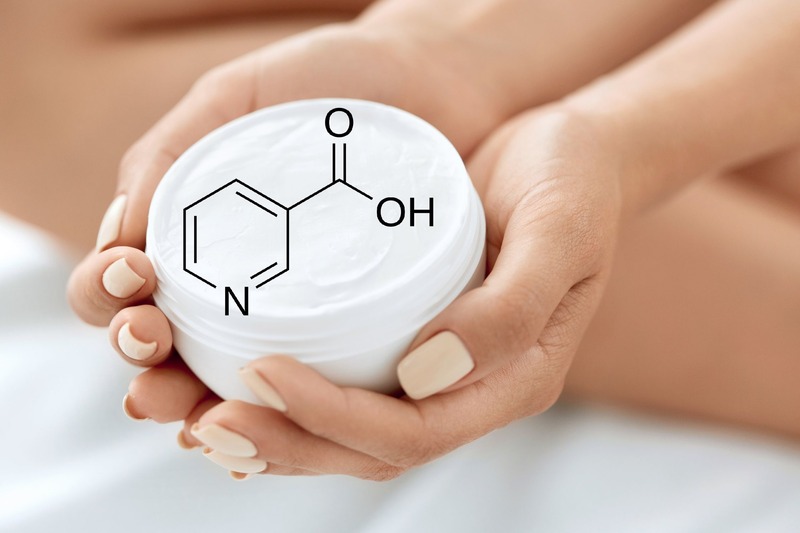 The researches on the external impact of vitamin B3 on skin was launched in 1975, but the most intensive work concerning its medicinal use (mainly in cosmetics) took place no sooner than in the 90s of the 20th century. It was discovered then that a great amount of vitamin B3 the applied to skin is able to penetrate it deeper and combat various skin ailments such as acne, discolourations, breakouts, skin roughness and inflammations. It was proven that the effectivity of vitamin B3 can be boosted by making use of special compounds – so called sorption promoters. Additional asset of vitamin B3 is the fact that when compared with other chemical substances of similar properties, such as retinol, niacin is more stable and resistant to light, warming up and oxidation, which significantly facilitates using it for cosmetic production. Vitamin B3 weakens the process of losing water through skin, regulates epidermis regeneration processes and stimulates collagen production in fibroblasts (skin cells). Moreover, it’s a strong antioxidant, it combats free radicals, protects skin against the harmful effect of UV radiation, reduces visibility of discolourations and prevents new ones from appearing. Thanks to vitamin B3 skin becomes smoother and healthier, so it looks younger. To make a face cream with vitamin B3 more effective, its concentration must reach at least 2 percent. Although the cosmetic concerns are obliged to provide the list of ingredients in a particular order (starting with the substance which concentration is the highest), yet they don’t have to precise their percentage share. How to deal with this? Simply it’s better not to choose cosmetics which composition features vitamin B3 somewhere at the end of the ingredient list. Vitamin B3 takes part in metabolic conversion of carbohydrates, fatty acids and amino acids. Also, it takes part in producing red blood cells, dilates blood vessels, reduces level of bad cholesterol as well as neutralizes toxic action of chemical compounds and medications. Vitamin B3 is able to improve mood therefore it is used to treat physical disorders such as schizophrenia. The shortage of vitamin B3 causes general weakness, insomnia, migraine and memory problems, and sometimes even diarrhea, aggression and depression. The lack of vitamin B3 is easy to notice by looking at skin that is reddened and rough. The very changes together with inflammations and mouth ulcers mainly appear in the body parts that are exposed to the sun. On the other hand, the excess of vitamin B3 causes dilatation of blood vessels, tingling, itchy scalp, tinnitus and indigestion. Moreover, if there is too much of vitamin B3 in the body, this situation may lead to appetite loss, liver damages and cause hepatitis, cardiac arrhythmia and psychosis. Luckily, it’s hard to overdose vitamin B3 because niacin is water-soluble and excreted with urine. What are the sources of vitamin B3? Vitamin B3 can be found in products with a huge protein content, and this is lean meat, liver, heart, poultry, fish, bean and pea. Moreover, niacin can be found in barm, dried peach, wholegrain, almond and fungi. It’s compatible with other vitamins that belong to B-group (B1, B2 and B6) and it’s contingent on their presence therefore vitamin B3 must be taken with them. Moreover, chromium boosts vitamin B3 effectivity, whereas the excess of sugar works the opposite way. Vitamin B3 is resistant to high temperatures, acids, lyes and UV radiation. When boiled, it becomes an infusion that is worth making use of.